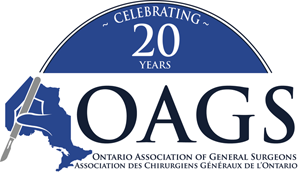 The Ontario Association of General Surgeons (OAGS) is a non-profit organization that represents General Surgeons throughout the province of Ontario. It is an interest group that works with other organizations toward improving the working conditions of General Surgeons and, in turn, the overall health care conditions of their patients. We have been celebrating 20 years of service (1995-2015) and hope to continue acting as the voice of General Surgeons of Ontario for years to come!